We got all our boxes in! I’m so excited to start. The Abeka program looks like so much fun. I know it’s going to take a lot of effort on my part to keep things running smoothly, but I’m so up for the challenge! I love the idea of going for a more traditional (rather than progressive) approach. We start on Monday, so this weekend I will try to let you know what we are doing to get into focus and stay organized. First up: Abeka-themed task cards. I do understand he wont really be doing seat work for a while yet, but I wanted him to have a visual reminder of how much work-before-play needs to happen each day. This way, as he transitions to more independent work, he will already know what to expect for each day much like he does with his chores already. Please share this download with others via this post, not the document itself. This download is intended for personal or classroom use only. This download was not intended for any individual or entity to profit monetarily from. Enjoy! I tried to include everything we will be covering (at least at some point in the year) with the new curriculum in one convenient chart. I even put four “ask Mom” boxes for anything that remains unplanned. 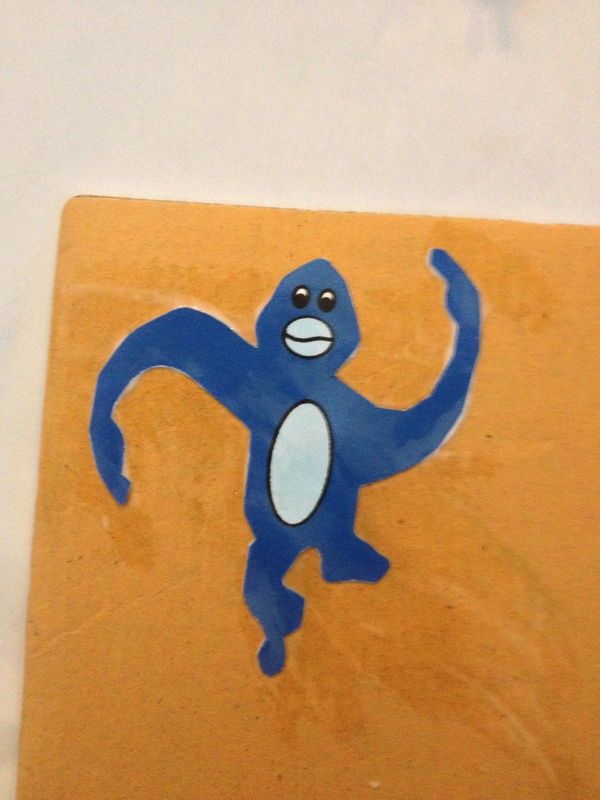 I placed the sheet in front of his notebook in a dry erase cover. Then, I simply cross out whatever is not required for the day. 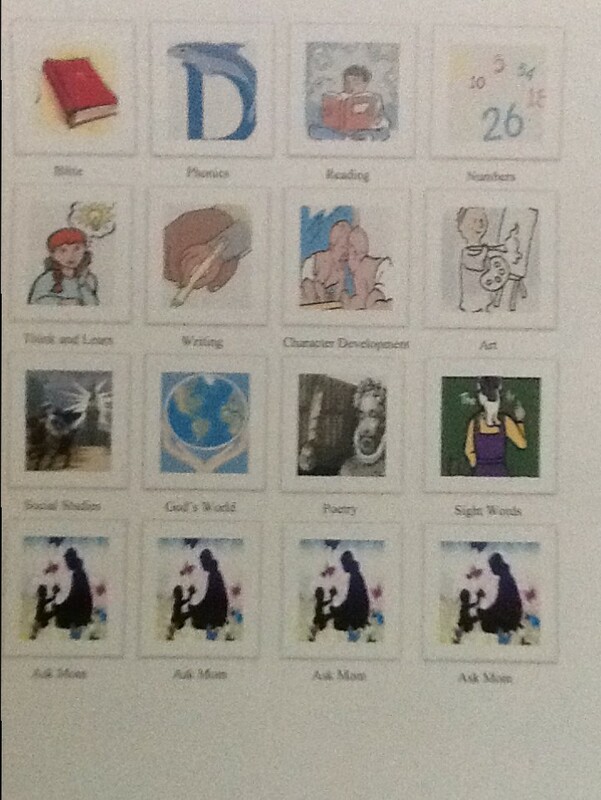 This saves us wall space, but you could also copy it twice, laminate, and velcro to use as task cards like the Unlikely Homeschool created on her wall. I can’t wait to show you more as our week unfolds! I’ll try and post frequent updates, but it appears that (at least until I have a routine down more) I can only promise weekend posts! Keep reading to find out what his notebook looks like, how he likes or dislikes it, and more successes and struggles. How do you keep your children focused and on task? I placed the chart in a dry erase sleeve (I will eventually move it to a cute picture frame) and placed it on the wall. Above that I taped their incentives where they would be plainly visible. Blueberry ball gets a Hot Wheels car each Friday if Mom and Dad feel like he has earned enough stars. Today Blueberry Ball had fun with more of the same: we did addition practice and we did sight word spelling and recognition. I had three activities set up at the coffee table this morning to peak his interest. 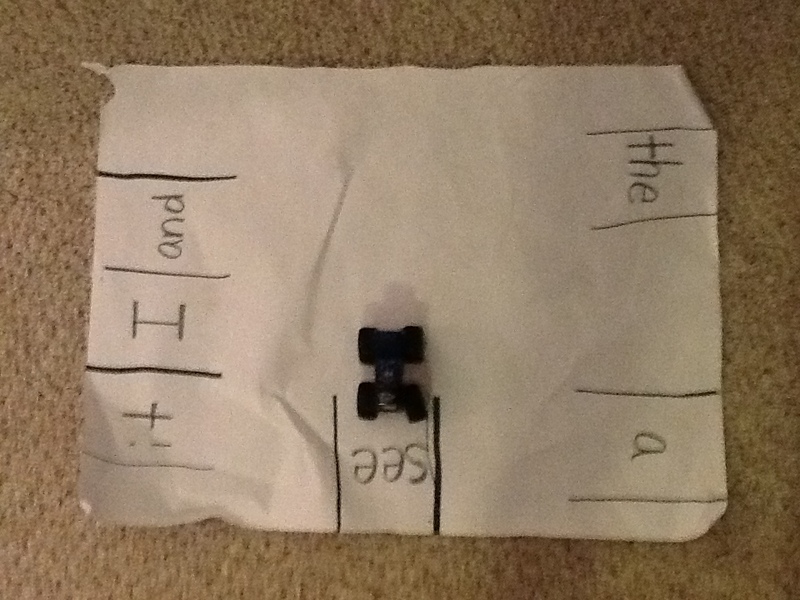 The first one that caught his eye was (of course the car one) the “sight word parking lot”. Juggling With Kids gave me this great idea. I simply took a large sheet of paper and drew lines on it to create “parking spaces”. 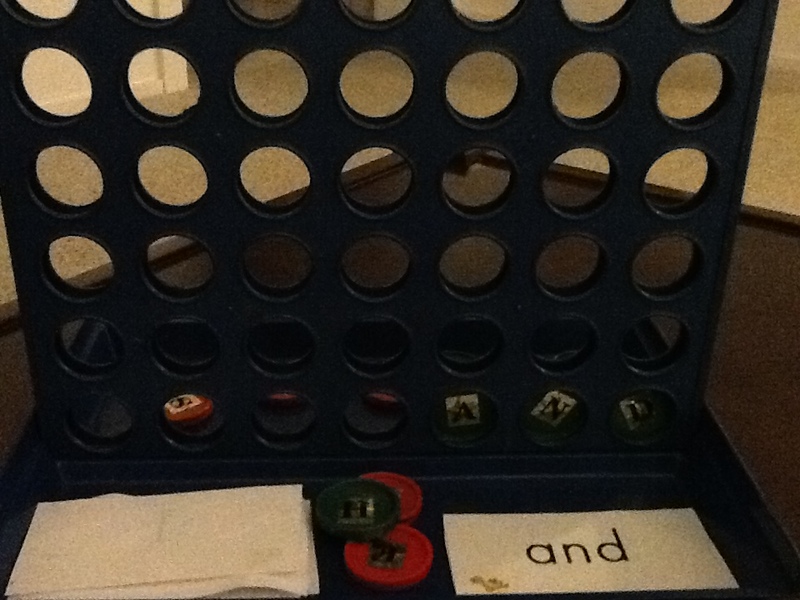 Then, I added a sight word to each of the six spaces. This was an awesome activity for him. We will be doing this again when he learns a few more words. Great review! 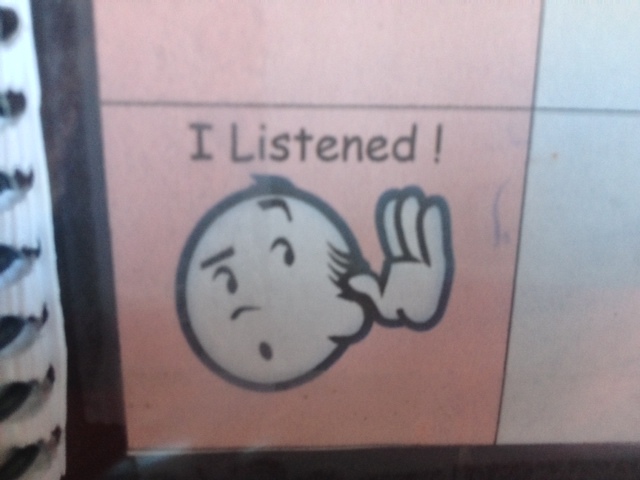 After he started losing interest in that one, we did an addition worksheet. 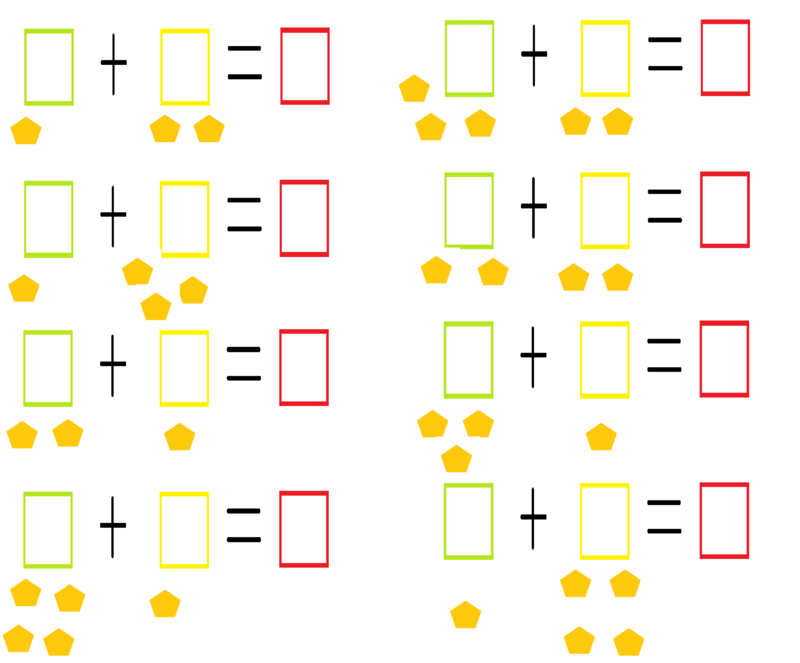 Last night I took the Red Light Green Light Blank Addition Template and added hexagons for him to count. I asked if he could recognize the shape first, and we went from there. It was good review for shapes by simply restating, “ok, two hexagons plus three hexagons equals how many hexagons?”. I helped him with the first couple, and he did the rest. Freehand numbers are still a bit challenging for Blue, so this is an activity I have to stay close by Blue with to ensure the scribbles don’t happen as the result of getting frustrated or overwhelmed. I also let him watch me place the numbers 1-10 down the side. This way, he can trace the ones he needs to prior to trying it freehand. He did excellent, though. 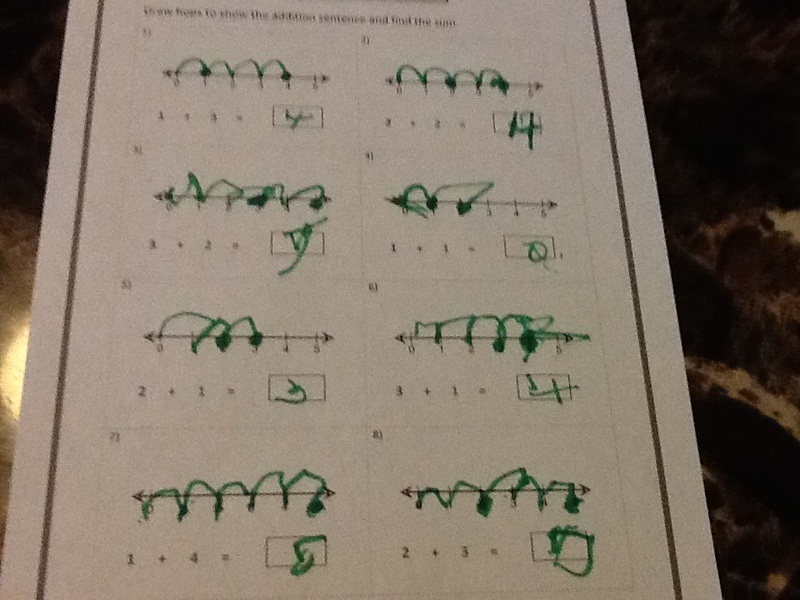 He will be doing these worksheets on his own in no time! Simply click on the image. Either “Save as” for later, or print directly from the image. Be sure and fit the image to your paper size, and choose the landscape setting. 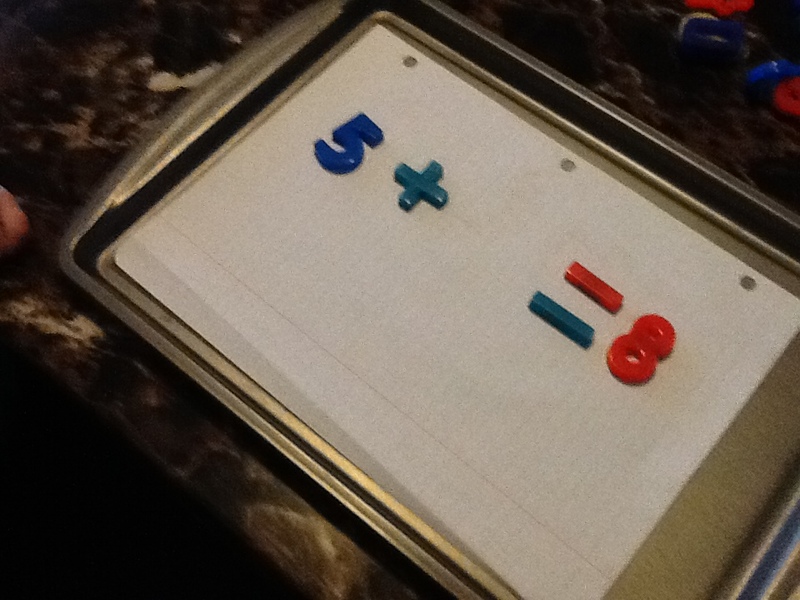 Next, we pulled our magnet activity from the coffee table. We have an adorable monkey lunch box that Grandma got the kids a while ago. 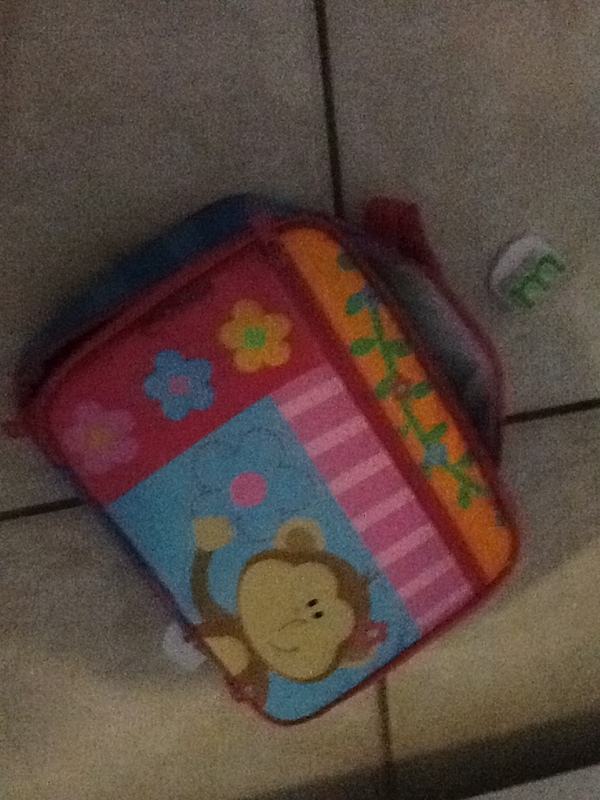 I keep all the letter magnets in this bag, along with their leap frog spelling magnet game. It fits well, and Raspberry Bug is all over anything monkey or duck right now. 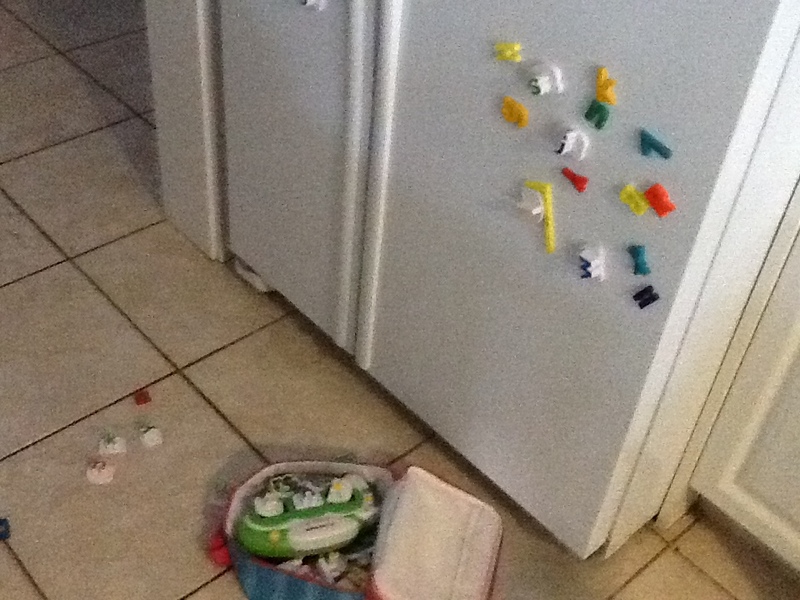 I set her to the fridge and she practiced her letter recognition while making a jumbled mess all over the fridge. It kept Red entertained for longer than Blue’s activity. Then I added batteries to the Leap Frog and her fun started all over again! 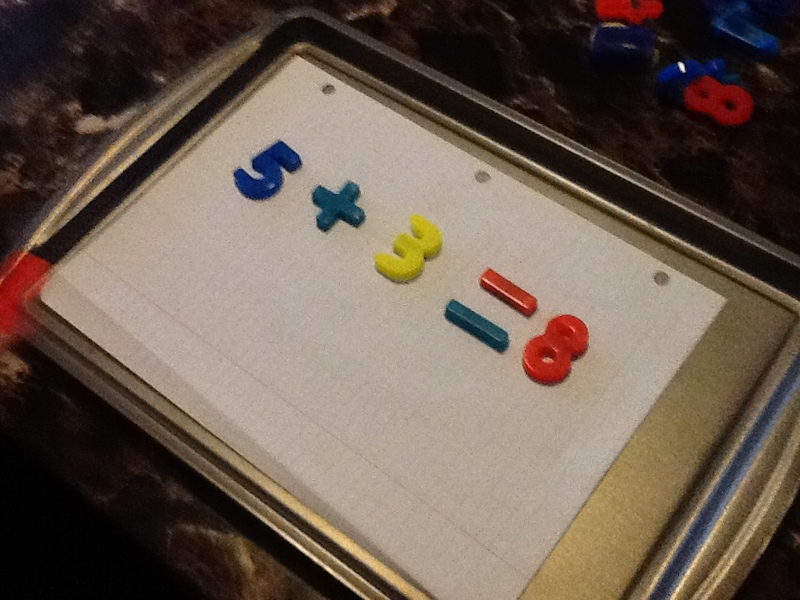 Last night, I wrote his six sight words on a sheet of notebook paper for Blue and placed it on a cookie sheet. I then added letter magnets. I mixed all different kinds of letters for two different reasons: one- I simply didn’t have enough to do all one kind of magnet. Two- I like that it challenges him to work with different letter fonts and with lower case and upper case practice. That was also good letter recognition review. He liked this activity. Especially after I told him he could put the letters on top of the written words instead of on the side. Whatever floats his boat on that one! 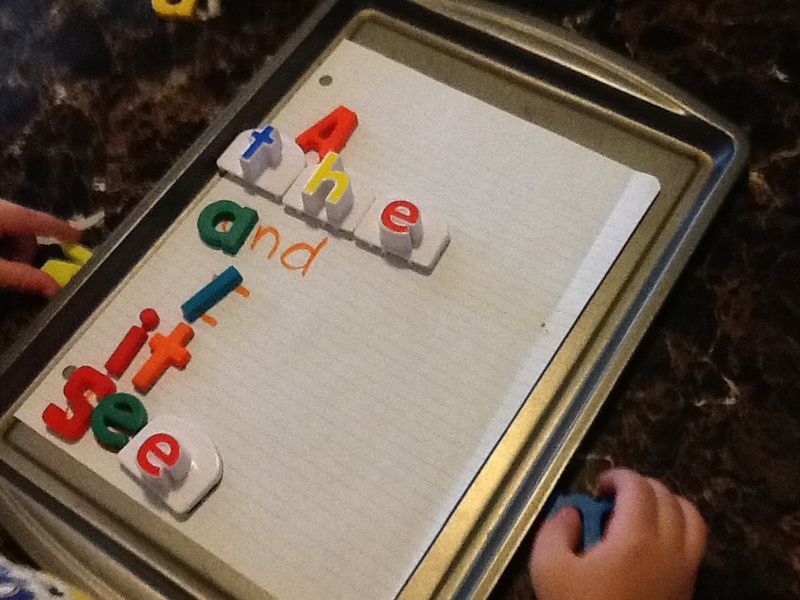 I could tell he wasn’t ready to stop the magnet play yet, so I decided we would flip the page over and do some more addition with the magnets. Then I did another little experiment. I gave him the sum, but he had to find the other missing number. I instructed him to hold up one number’s worth of fingers on one hand and to start counting up with the opposite hand. I could see he was working a little harder, but he really got the idea. To me, this is no different than writing it out on paper. He’s learning the same concepts, but this one had toys added into the mix. It turned it into a game. He pretty much did double the amount of work he would have if it were only written. 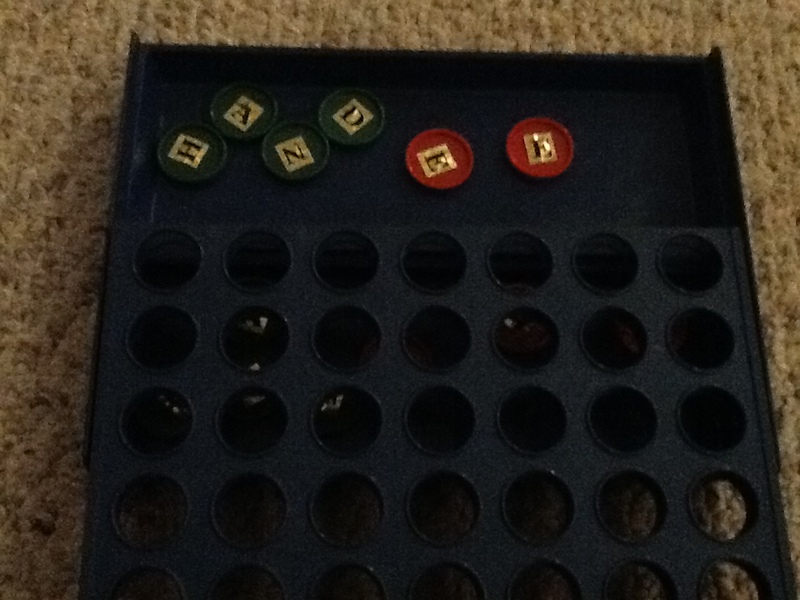 After all the magnet play, we grabbed the third game off the coffee table. Sight word “Connect Four”. Okay, we didn’t actually play “Connect Four”. I modified the game to fit Blue’s learning needs (and to fit our lack of checkers…) I placed a golden letter sticker on each checker. I don’t really like how the stickers get all bumpy when stuck on top of the star, but they do seem to stay on pretty well anyway. Blue drew a Sight Word Flash Card and tried spelling a word by finding the matching letters. I’m not sure why, but he wasn’t too into it. It was a matter of two words before he was passing it to Red and wanting to do something else. That’s okay, that just means Red got to do more letter practice. Not to mention the fine motor skills she worked on while attempting to place the checkers in the holes. The last activity I had planned was number line addition. I got another free printable from Math Worksheets 4 Kids. They call it “Drawing Hops”. 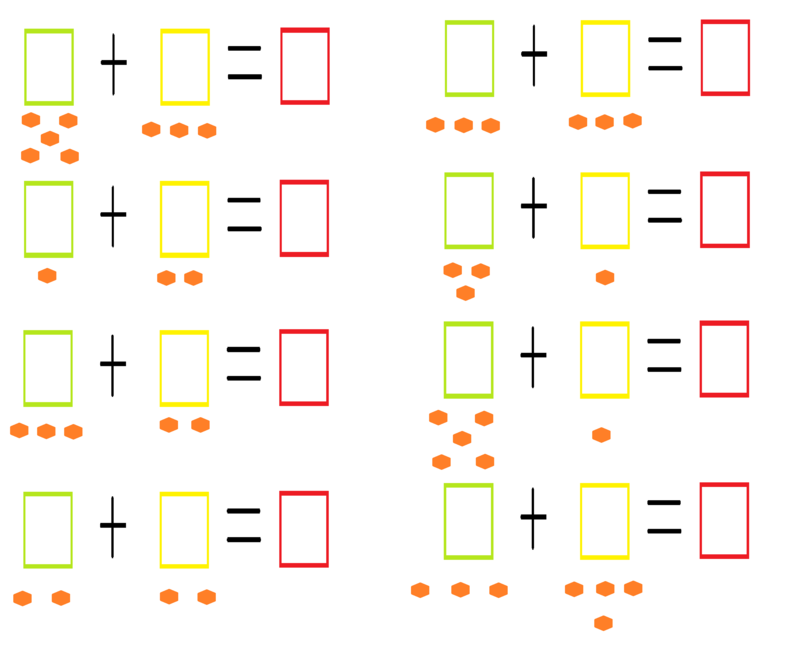 I don’t know that this is the best way to teach addition, but I do know that it is always good to present more than one method or visual aid. 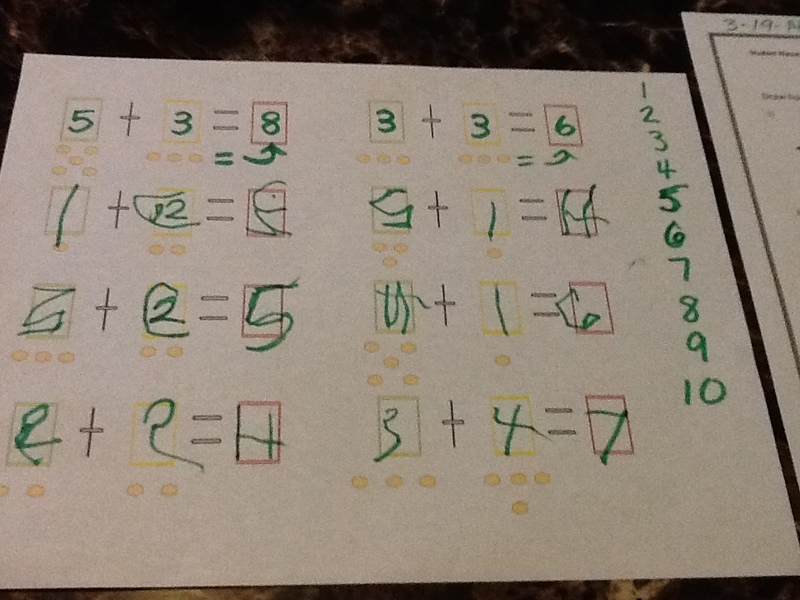 It wasn’t very easy for Blue, and I guided his hand on all but writing the numbers. Plus, he did the last one all by himself. He liked the idea of making his marker “hop”. It was a fine introduction, and we will do it occasionally, but I don’t think it was his-or my- favorite. I hope you enjoyed this post and I would love to hear what you’re doing to encourage or introduce your child when it comes to reading, writing, and arithmetic. The more creativity, the better! I’ve written in the past of how well the “red light green light” method has helped my son learn the preliminary steps to tracing letters. He already understood how traffic lights work and he has been an excellent backseat driver since he could talk. I guess he takes after Daddy on that one =). So when we began printing practice with the ABC Jesus Loves Me Curriculum, he ran with it. They did a great job using a green dot to show where to start and a red dot to know when to stop. 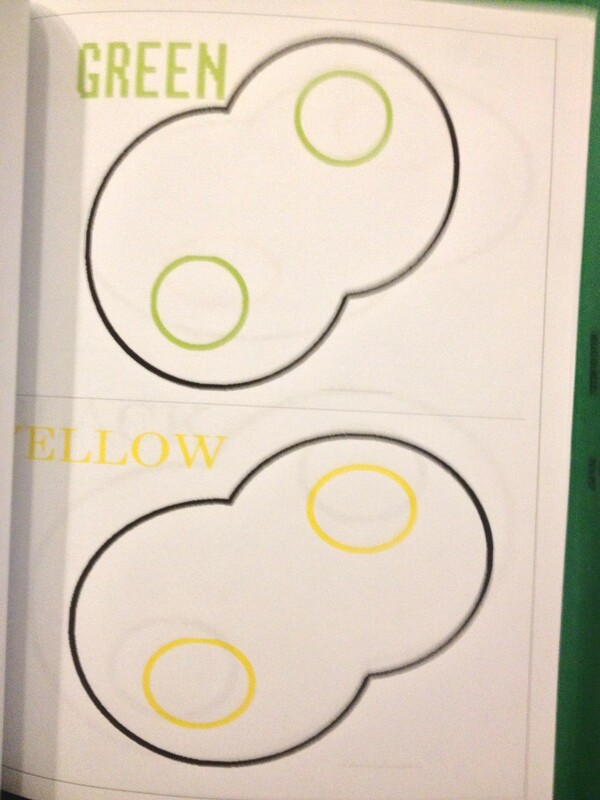 He knew the yellow means go slow, so it was great that the author made these with yellow lines as well. These worksheets helped Blueberry Ball to enjoy writing practice when he hadn’t before. When he was using these worksheets, he usually pretended to make a road for cars to go on, or that his marker was the car. It was just what he needed and it was even the inspiration for some of the printing practice found in my Green Eggs And Ham Pack. 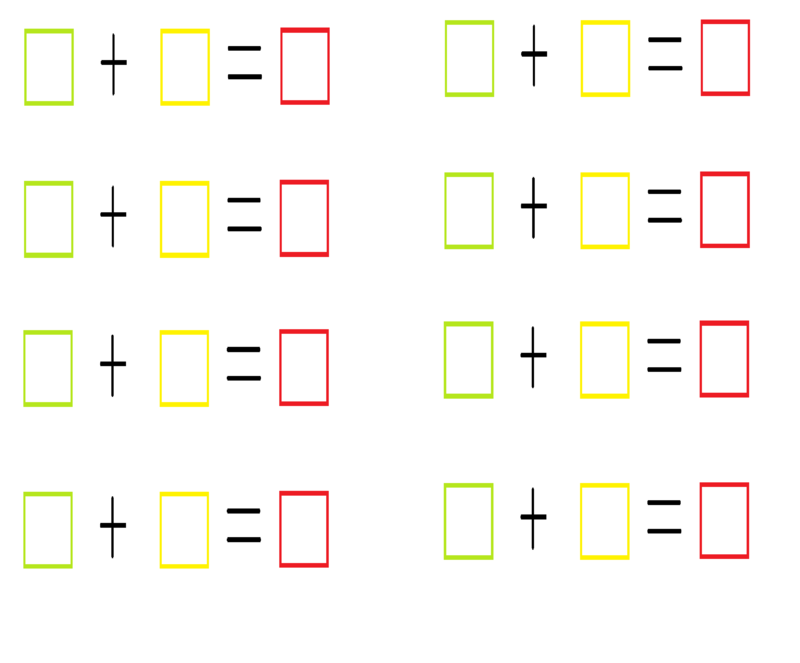 I found an awesome way to incorporate the left to right, top to bottom rule with addition, too.The first box green, second box yellow, and third box, red (go, slow, stop). 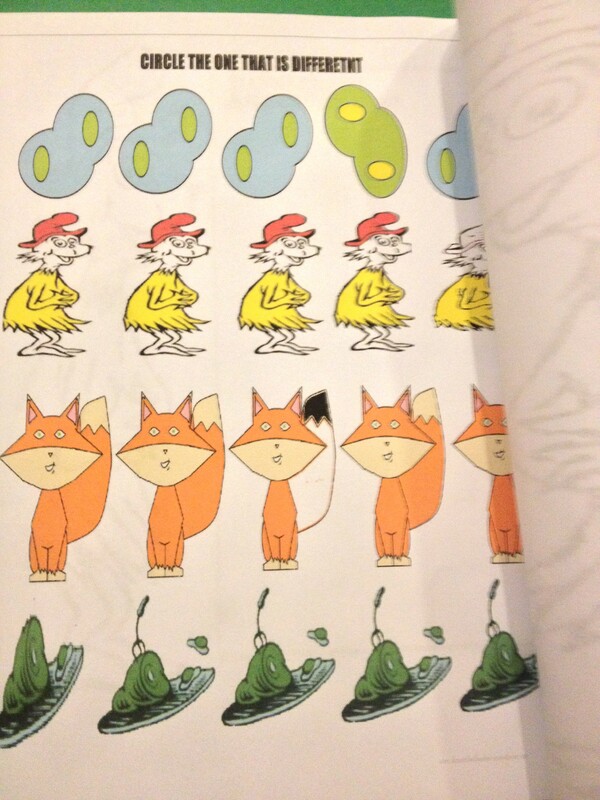 It allows him to visually focus in on a problem at a time instead of getting lost or bouncing around the page. Even though I have all the Adobe programs and can work with them pretty well, I still prefer the good old-fashioned paint program for easy things like this. And it allows me to be able to share editable materials with all of my viewers. Having said that, this is the first of probably many more math worksheets I will be publishing for your own home or classroom use. This one has no pictures on it (hence, blank template), so feel free to use it as is with manipulatives. You can also freehand your own drawings or shapes under the boxes, or open the document with Photoshop or Paint and get creative! Let me know if this as helped you out. I would love to see how and maybe even feature your work on Home School On A Dime as well! As with all other printable freebies on this site, I ask that you not use this for monetary gain in any way. If you wish to share this material, please link to this page and do not share the file itself. Thank you for understanding. To download, right click on the picture and “save image as”. When you print it out, remember that it should be on a landscape setting and it will most likely work best when you fit the image to page. Please tell me if you have any issues with this, and I will fix them as soon as possible. Enjoy! 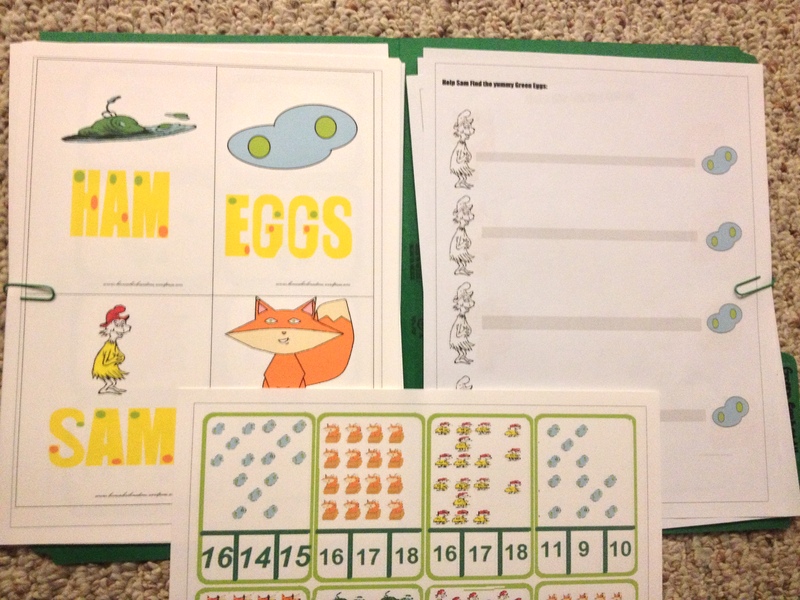 I’m so excited to introduce my first-ever Printable Preschool Package: Green Eggs And Ham. 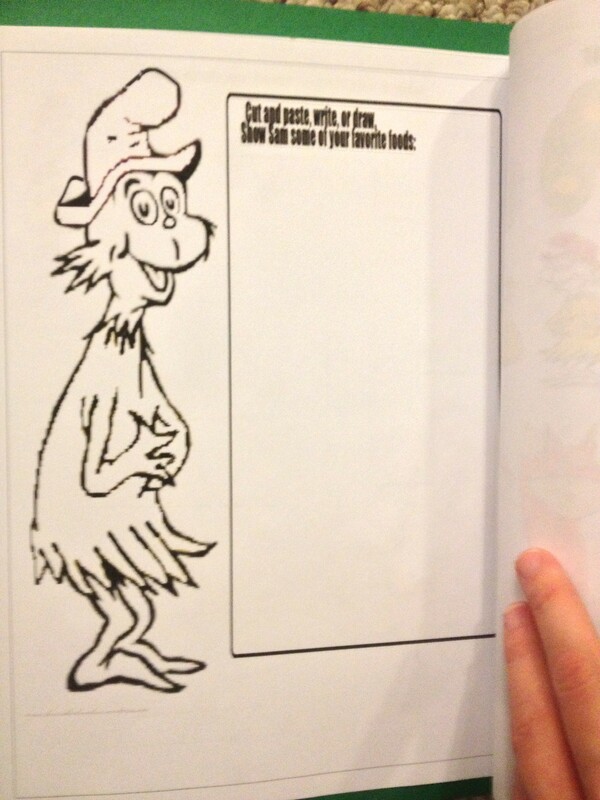 I couldn’t find many Dr. Suess printables for free online, so I decided to create my very own line. The pack ended up being quite large, and as a result, it was easier to just do it as a pdf file. 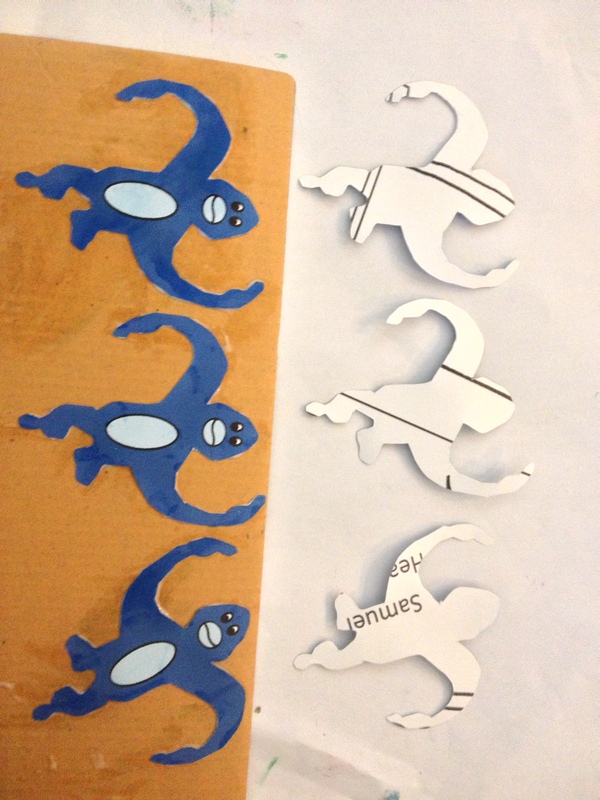 I made these for this week’s lesson plan. We will be reading Five Silly Monkeys this week, so this will be a lot of fun to do with both children (hopefully I can complete them all in time). I made the printouts in various sizes so that you can pick the one that interests you.There are full-sheet, half sheet, and a six per sheet in the download. 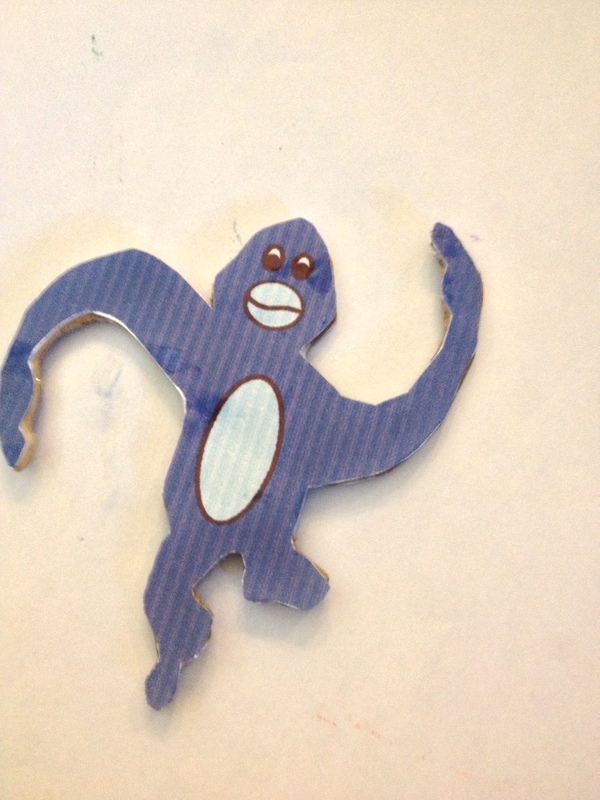 I flipped the image, so you can either have two facing opposite directions with a monkey printed on one side, or you can glue them together back to back. That’s what I did, with very thin cardboard in between layers for durability. As always, my printouts are free and editable. Feel free to edit for your own educational purposes. Add shapes letters, or numbers to the tummies, for a few ideas. If you have edited it with a great idea, send it back to me and I’d be happy to share with my readers! Also, if anyone has any ideas for making a barrel or other fun house for my monkeys, do let me know. This document is intended for your own personal or classroom purposes only. Not to be duplicated on the internet in it’s original or varying forms. If you would like to share this printable with others, please link directly back to this post, not the document itself. ENJOY! I like to keep my planning well ahead of the game when it comes to homeschooling. I try to have at least four weeks worth of lesson plans printed and prepared for Blueberry Ball at a time. I got quite a bit behind on this the last few weeks and now am playing catch up. As a result, I have created a four week printout checklist for myself to make sure that I haven’t forgotten anything when it comes time for my Weekly Prep Checklist. Feel free to use this printout for your personal home or classroom use. This is not intended for the monetary gain of any individual or entity. If you would like to share this document, please link directly back to this post’s URL and not to the document itself. Enjoy!